Looking for a substantial warm appetizer for your next party? 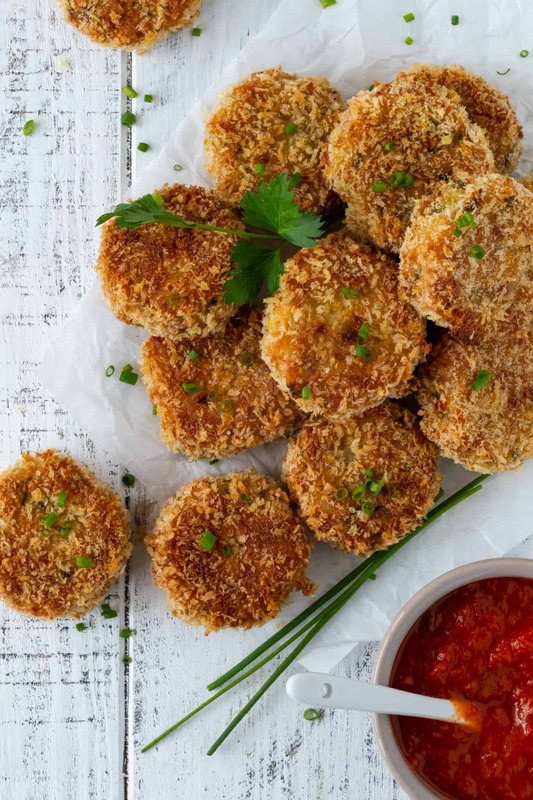 Look no further than these baked Fontina Chive Risotto Cakes! Although I love the simplicity and approachability of a Meat and Cheese Tray or Veggie Platter as an appetizer, sometimes I like to shake it up and offer guests a munchie that is just a little bit unexpected. These Fontina Chive Risotto Cakes fit the bill perfectly – hearty, flavorful and always the talk of the party. Plus they can be prepped in advance which any time-starved host appreciates. What the heck are Risotto Cakes? 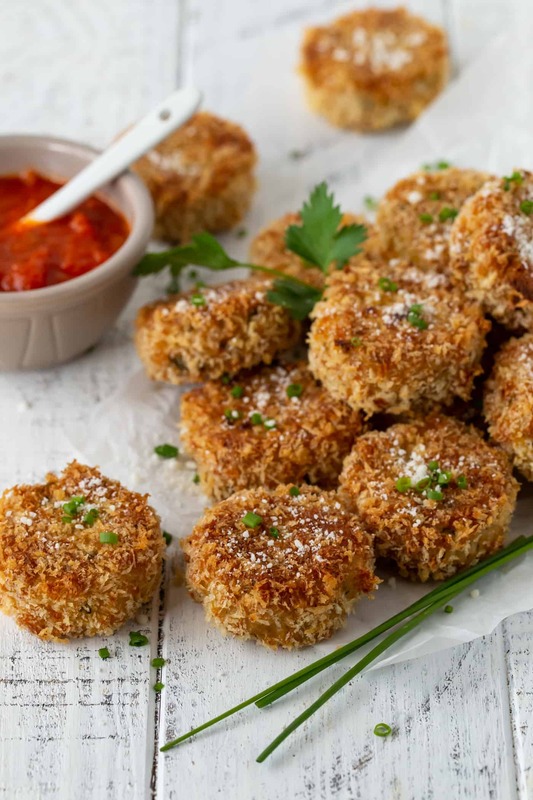 Risotto Cakes are fried little cakes of risotto. To be honest, they actually look more like hockey pucks, but Risotto Pucks just doesn’t have the same ring to it as Risotto Cakes. My recipe for Risotto Cakes is baked, not fried, making them a heck of a lot easier to make and better for you, too. How do I serve Risotto Cakes? I often serve these Fontina Chive Risotto Cakes as appetizers. When you make them a bit smaller, they are the perfect crispy bite to kickstart a party, but you can also make them larger and serve them with a dressed salad as a light main meal. Can I make this Risotto Cakes recipe in advance? Yes! I’m a huge advocate of prepping as much as you can in advance, so you can bet I tested this recipe to ensure it’s freezer-friendly. After you’ve formed the risotto cakes (but before you’ve dredged them in egg and panko), place them in an individual layer on a sheet pan and pop them in the freezer. Once they are frozen through, you can store them in a freezer-safe bag. When you’re ready to make them, defrost the number of cakes you need in the fridge. All that’s left is a quick dunk in an egg wash and a roll in some panko crumbs before they are ready for the oven. 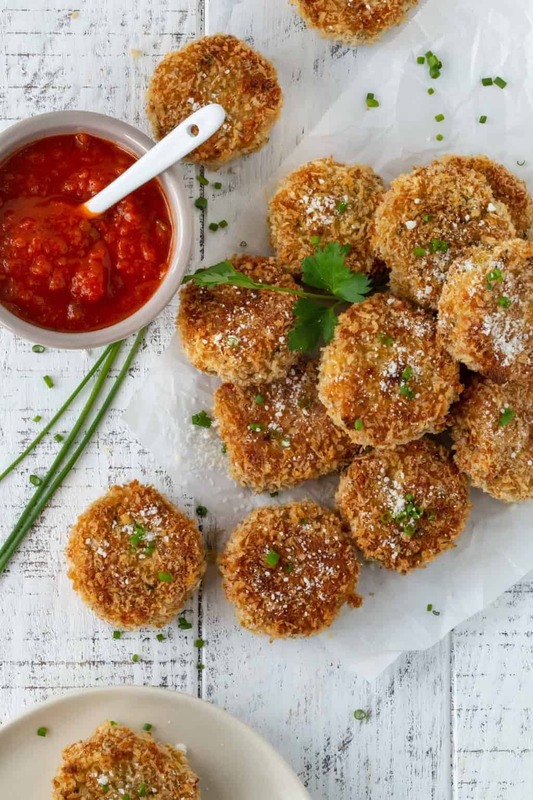 Don’t forget the sauce for these Risotto Cakes! My favorite sauce to dollop on top of these cakes is my Sweet and Tangy Tomato Jam. (Haven’t tried it yet? You NEED to! It’s seriously one of the most versatile condiments ever.) But if you’re short on time, any chunky marinara sauce will do nicely, too. Got leftover risotto? Make Risotto Cakes! This basic recipe for Risotto Cakes is a great way to use leftover risotto. You can easily scale this recipe to fit the cooked risotto you have in your fridge. You can even stir in some additional herbs or a handful of cheese to give your leftovers a flavor boost before forming the individual cakes. Looking for more unexpected appetizer recipes? Check out these tasty nibbles! Looking for a delicious warm appetizer for your next party? 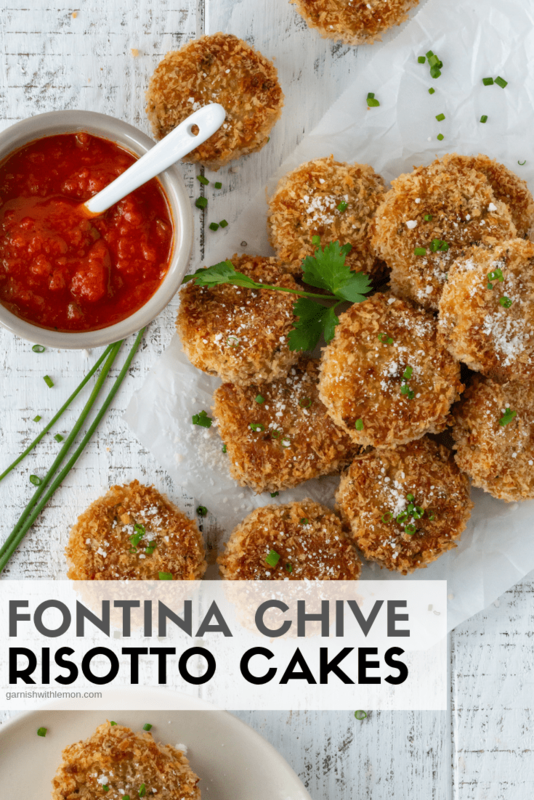 Look no further than these baked Fontina Chive Risotto Cakes! A great use for leftover risotto, too. Bring broth to a simmer in a saucepan. Turn heat to low and keep warm. Meanwhile, place olive oil in another pan and heat over medium heat. Add onion and saute until translucent. Pour in rice, stir until coated and cook for about a minute. Add wine to saucepan and stir until it is absorbed. Start adding warm broth 1/3 cup at a time to the rice, stirring constantly until liquid is fully absorbed before adding more broth. After all of the broth is incorporated, remove pan from heat and stir in Parmesan cheese and butter. Add salt and pepper to taste. Pour into a 9 x 13 pan and allow risotto to completely cool. Generously spray a baking sheet with olive oil. Whisk remaining eggs in a shallow bowl and place Panko in another shallow bowl. Dip each cake in egg and then dredge in Panko. Place coated cakes on the baking sheet. Generously spray the tops of the cakes before baking for 25-30 minutes, turning once. These look delicious! I love risotto and love the idea of them in the form of a cake! yum! I love it, too, and that little bit of crunch from the Panko is fantastic with the cheesy, creamy risotto.